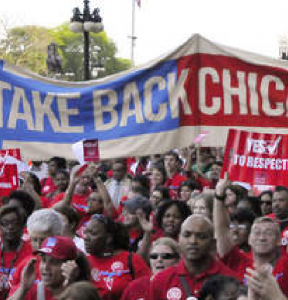 “Like Mayor Rahm Emanuel, student-based budgeting (SBB) needs to retire. Increasing school budgets by $55 million looks like a nice stop on his farewell tour and a flashy headline for CPS to start the week, but from what we’ve seen, the deficiencies in this budget point to the district’s failure to recognize the real needs of its students. CPS is still around $2 billion from adequacy, according to the Center for Tax and Budget Accountability, so this $55 from the mayor is pittance—especially in comparison to other projects he’s thrown taxpayer dollars to, from the $95 million police academy to $1.3 billion for Lincoln Yards. There is also no mention of new, progressive revenue for schools here, which is very much in line with the mayor’s record of leadership in our district. “The fact of the matter is this: Student-based budgeting is a failure and has led to year after year of cuts to schools and veteran Black and Brown educators in communities struggling with enrollment loss. The $31 million in supplemental ‘equity grant funding’ that CPS is providing to prevent further deep cuts to school budgets is nothing new, nor is there anything supplemental about the bare-bones resources and staffing ratios currently in our schools. “SBB is out of compliance with the state’s new funding model, which is modeled on real equity, based on need and doesn’t hold schools accountable if enrollment drops. Despite appearances, the district is far from providing equity. The $31 million in funding for 219 schools amounts to about $141,000 per school. The state’s evidence-based funding model shows a district-wide need for an additional $2 billion, which amounts to $3.1 million per school for 644 schools. “That $2 billion gap must be closed. While the district proposes $31 million in equity grant funding for 219 schools, that same amount would be necessary just to put a librarian in every CPS school. A social worker in line with recommend caseload ratios would cost $90 million. Nurses in every school would cost $70 million. Reducing class size to recommended levels would cost $150 million. This is what our schools and our students need. “Regarding charters, CPS violated state law and funded charter management companies tens of millions of dollars more than required. 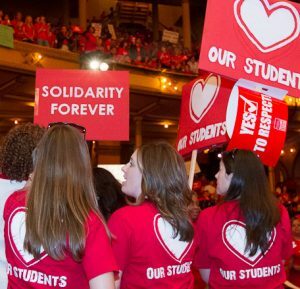 Educators in two of the city’s largest charter networks then spent weeks on strike to force those resources back into classrooms instead of spending on management fees and investment funds. Charter operators shouldn’t receive a blank check from CPS, because they certainly haven’t used the additional funding properly.